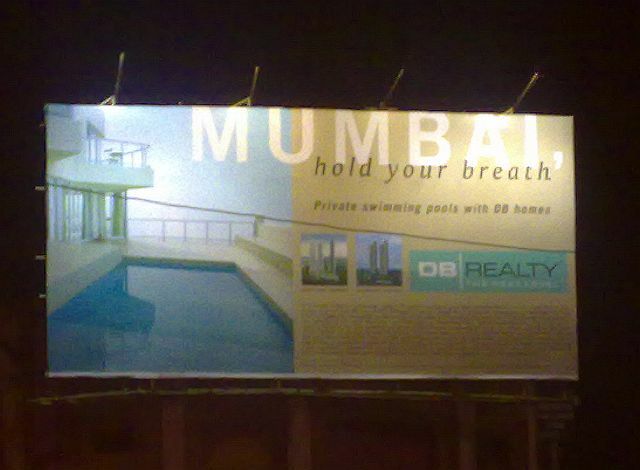 Can Mumbai afford private swimming pools? Spotted this hoarding at one of the busy traffic junction of South Mumbai. Seriously, can our city really afford to have private swimming pools? Isn’t the recent spate of water cuts a wake up call to all of us and that too a RUDE one. considering south mumbai has so far been the least affected by water cuts. Yet, our building suffered an uplanned/unannounced water cut for more than 48 hours. At a time when most hotels, gymkhanas and clubs are being asked to reduce water usage in their pools and gymnasiums I don’t know how and where are we going to bring in those million litres of water to fill up these “private swimming pools”. God can bless us and solve our problems, but I think this one needs to be solved by us. Let’s do our bit to conserve and use this natural resource responsibly.